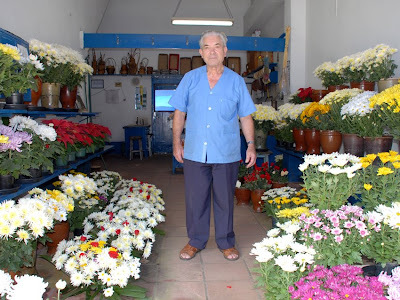 We spent two Sunday mornings with Antonio, who along with his sister Lucia, runs a pair of neighbouring flower shops close to the entrance of Cemeterio São Paulo, in the Pinheiros district of the city. Antonio is Portuguese, came to Brazil as a young man and married here. He looks unbelievably good for 76, a fact he ascribes to hard work, faith and not abusing himself with alcohol and women. He starts work early enough in the morning to see night clubbers returning home; he bemoans the sight of young women/men drunk and out of control. He handed Rebecca a simple printed prayer dedicated to a girl called Izildinha, ‘my kind little sister’. In a basic translation the prayer asks; for full devotion to the Father and the son; that the father and the son cover Izildinha with blessings and diminish the sufferings of all those that invoke Gods name; for repayment with good faith, and belief in the Father, the son and Izildinha; for a stripping of vanity, pride, envy and a forgiveness of evil and a dedication to love those closest; for happiness in the home; that honest work lead to life’s necessities; and that the bread earned be enough to feed those more needy. The atmosphere on these Sunday mornings was far more contemplative than Clinicas. Away from the main road, not many customers. Some of those that we met were weekly visitors to family graves. We asked them the same question about the story behind their purchase.